I’m off to a Ball in a few weeks time so have been pulling out my heels to see what will match to my dress. This is not as easy as it sounds as I haven’t quite decided what dress to wear! As much as I’d like to buy a new pair of heels I feel I should try and give a pair of my many neglected heels an evening out. The poor things are stuck in boxes for such a long time nowadays. 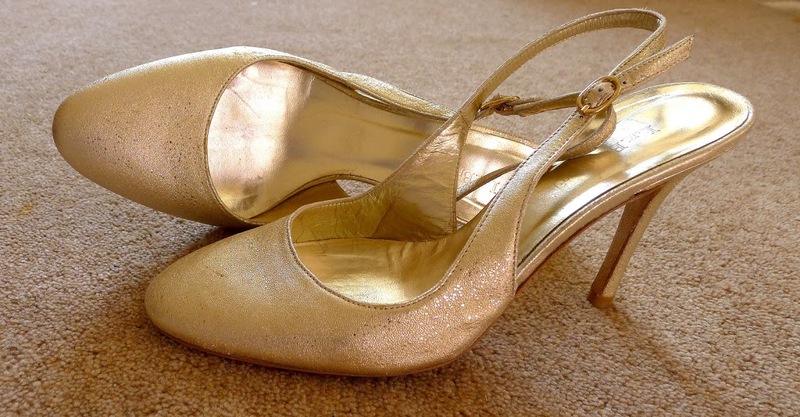 These are the only gold shoes I have ever owned and they have turned out to be really versatile. They look fantastic with a full on evening gown but also add sophisticated glamour to a pair of jeans or LBD. I am loving these shoes – hope you find the dress to go with them. I must say I did chuckle at the second picture – are they your legs and how on earth did you take that photo? The things we do for a good pic! I have a faithful pair of high heal gold shoes too. Like you never find the occasion to wear them anymore! Enjoy your ball in those, be worth not being able to walk the next day as they will look fab!